Tension Load Cells from Straightpoint. Manufacturer and supplier of a wide range of tension digital dynamometers, load cells available 0.5t to 500t with larger capacities available on unrivalled lead times. Systems and connected instrumentation and a full range of accessories. Number one choice for the glogal rigging industry. Hoists to heavy lift. 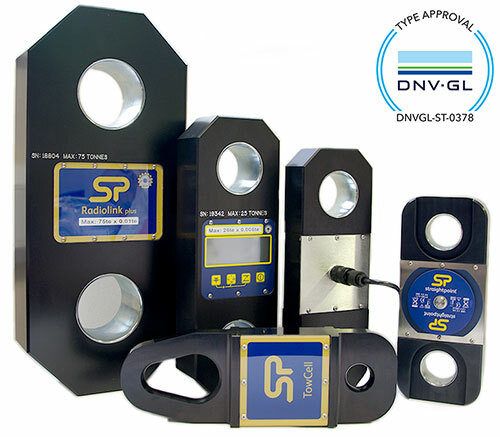 Tension dynamometer load cells and force sensor measurement systems manufactured by Straightpoint are renowned for measurement that achieves high accuracy, and is safe, reliable and stable. Recognised by industries across the world for the design and quality of their products, Straightpoint also enjoys an unrivalled reputation for setting industry-standard service, fast delivery, free support and flexibility. A dedicated team of staff at the ready for your needs and technical support. SP Tension Dynamometer Load Cell Range – There is a solution for you! > Radiolink Plus Wireless Tension load cell includes wireless handheld plus. > Loadlink Plus Tension load cell with digital display. > StageSafe switch easily between wired and wireless – designed for the entertainment business. 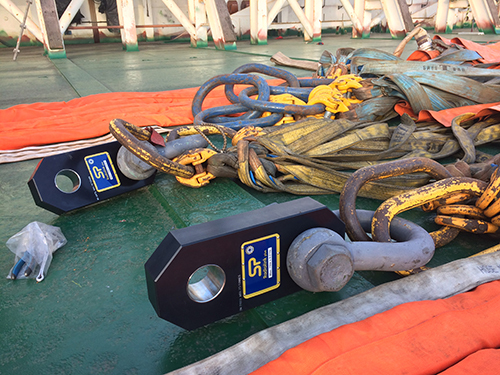 Photo left: SP Radiolinks in preparation to complete load tests on a Liebherr crane aboard a vessel in Cape Town Harbour, South Africa. Products and solutions for international industry are available for many industrial sectors including on & offshore oil and gas, military, entertainment, marine, aerospace, construction, energy and utilities, environmental, metals and mining, packaging and processing, shipping, salvage and transport. 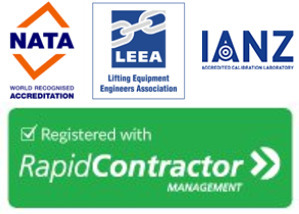 Engineers, technicians and rigging professionals at companies such as Airbus, Rolls Royce, Sarens, Technip, BAE Systems, Highways Agency, GE and many other global multinationals utilise the SP range of load cells in capacities up to and over 1500t for both static and dynamic load measurement projects with confidence and trust in a world class product with many years of history and credibility. All SP load cell dynamometers, tension, compression and shackles are in stock and available for purchase from our offices UK and USA as well as from our partners worldwide, click here to find your local tension load cell supplier.